The characteristic drawl of Timothy "Tiff" Needell has become well-known not only to British TV viewers, but also to millions of others all over the world who are able to watch the Top Gear show on BBC World. He has been a popular sidekick and track tester in the show for quite some time now. Anyone who has seen Top Gear has witnessed his really exceptional car-control skills. His looong powerslides are almost legendary! But maybe not everyone watching Top Gear knows he had a brief GP career as well. Already in the early 1980s Tiff began to develop a parallel career path into the media world. He is currently a columnist and feature writer for Top Gear Magazine as well as doing his work for the TV show. Tiff has almost driven everything on four wheels. The majority of his racing career he spent in various forms of sportscars. Born on October 29, 1951 in Havant, Hampshire, England, Tiff Needell attended the City University where he achieved an Honours Degree in Civil Engineering. Hegot hired by George Wimpy & Co Ltd and had his day job as Structural Design Engineer. His racing career started in 1970, when he attended a drivers course at Brands Hatch. His first results came in the the 1970 Daily Mail Stars of Tomorrow FF1600 when he finished fourth. In a somewhat unusual way he was able to continue in Formula Fords for 1971. He actually won the car through a competition in Autosport magazine! He used the Lotus type 69 for two seasons and despite little funds he was able to forge himself into a front-runner in the category. In 1973 he switched to an Elden chassis and due to financial struggles he was not able to score any results until 1975 when a friend loaned a Crosslé 25F to him. With this car Tiff won the Townsend Thoresen Brands Hatch Challenge. And he ended the year with a "special commendation" Grovewood Award. Progression to FF2000 followed in 1976, with Tiff finishing second in the APG Championship. He also won the Dunlop Award which was based on his qualifying performances. At the end of the year he was awarded the premier Grovewood Award. This meant further progression during 1977 and 1978 when he took seat in the crack Unipart Formula Three team. The Triumph engines they were using were not on par with the rival Toyota engines so they were not able to compete on equal terms. In 1978 at the twisty Cadwell Park in the wet Tiff was able to stay on the gearbox of a certain Nelson Piquet all the race, so when power was not paramount then his driving skills shone. Tiff actually did a brief appearance in Formula Two late in 1977 but for 1979 Tiff decided that time had come to take a further step. He was contracted to drive the unique Chevron B41 Formula One car in the Aurora Championship, with sponsorship from Durex condoms. Ensign also approached him to race in the British GP, but Tiff was not awarded the necessary superlicence needed for the seat. The Unipart Ensign team asked for his services again in 1980. This time the Tiff had the superlicence so finally, at the age of 28, he was now able to put the job of Grand Prix driver on his business card. He did his debut at Zolder (our picture) and qualified the difficult car in 23rd spot but retired from the race with a broken engine. He was given another chance at Monaco but didn't qualify the car. Only 20 spots were up for grabs so the chances for making the grid were remote at the best. He was 1.5 seconds from the 20th place. But he was in good company on race day, because neither Keke Rosberg, John Watson, Geoff Lees nor Eddie Cheever made the grid. Needell's involvement in Formula One came to an abrupt end and he commented: "I had the satisfaction of reaching the ultimate formula, but was frustrated at being replaced by a supposedly more experienced driver, having failed to qualify at Monaco. Undoubtedly the highlights were qualifying 19th fastest in the first wet session at Monaco, ahead of drivers such as Mass, Jabouille, Patrese, de Angelis, Cheever, Lees, Zunino and Kennedy and 12th fastest in the second wet session at Zolder." He finished the year in Japanese Formula Two and the Selangor Grand Prix driving a Formula Pacific. Exiled from single-seaters Tiff now moved on to sportscars. He also took on his media role from now on. The rest of the 1980s were spent in various Group C cars, mostly driving for Japanese teams. He began his long Group C career in the unloved Nimrod-Aston Martin. At Le Mans this car gave Tiff a wild ride when a rear-end failure sent Tiff into the barriers on the long straight at high speed. He was back at Le Mans in an another Aston Martin powered car, the EMKA. This car looked more purposeful, and it had a Tickford-prepared Aston V8. During the race itself the team cleverly engineered a ploy in which Tiff made an early "splash-and-dash" stop for fuel only. When the leading cars came in for their scheduled stops the EMKA was able to stay out and in due course actually inherited the lead! The first Aston Martin powered car to lead at Le Mans since 1959! Their moment of glory lasted for 20 minutes… After a losing 43 minutes in the pits due to clutch problems they finished down in 11th place. In 1986 Tiff jumped onto the abortive Lamborghini foray into Group C. Financing came from Unipart, Tiff's faithful backers. The car was an old Tiga GC83 chassis rebuilt during 1985-'86 into what was entered as a "Lamborghini Countach QVX". The bulky engine originated from a Countach road car, being a 5.7-litre 60-degree V12 developing some 650bhp. The initially promising three-year and rumoured £4 million programme looked attractive on paper. As in many cases over the years the project ultimately came to nothing. Tiff appeared in the car just once. This was in the non-championship invitation race held at Kyalami late in 1986. It would never had raced at all if it hadn't been for the appearance money from the isolated South African apartheid regime. Tiff drove the 500km singlehandedly and the device was reliable enough to actually see the chequered flag at the end. A fifth place was his reward. For 1987-'88 Tiff was back in Japan driving for the TOM'S Toyota team. During 1989-'92 Tiff mainly drove Porsche 962 cars for various teams. He finished a fine third at Le Mans in 1990 with the Alpha Porsche 962. Tiff was back in a GP car in December 1991 at Estoril when he was able to sample a current Williams FW14. His track test was featured in many motorsport magazines. Tin-tops followed in 1993-'94. A time when the British Touring Car Championship began to grow stronger and stronger. No results were gained in either year while driving an Ecurie Ecosse Vauxhall Cavalier in 1993 and a Nissan Primera 2.0 eGT in 1994. Mainly driving Lister Storms in the British series in 1998, he scored two wins at Snetterton and in the October 4 meet at Silverstone. Tiff also was invited to drive a Nissan Primera for Ray Mallock in the BTCC race at Brands Hatch in August. Another Top Gear season is on its way at BBC World and we have already seen Tiff in his usual way racing in the Lotus series. One year away from his big five-oh, let us Tiff Needell fans hope that he carries on in his unimitable style for a long time to come! I hate Tiff Needell. Always have done. Well, for nearly 30 years anyway. And I've never even met the guy! Just imagine what a shock it was to see him on 'Top Gear' (BBC's motoring magazine for those outside the UK). He started racing in Formula Ford in the early 1970s, coming 2nd in the 1974 'Wella for Men' championship and winning the 1975 'Townsend Thoresen' Championship, for which he won a special commendation at the 1975 Grovewood Awards. In 1976 he moved to Formula Ford 2000 and won the 'Dunlop Pole Position' championship and came 2nd in the 'Allied Polymer' championship, carrying off the premier Grovewood award as a result. 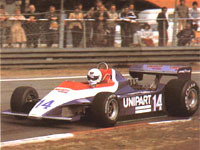 1977 saw Tiff land a drive with the Unipart F3 team, and in 1978 he came 4th in the British Championship, as well as some drives in the Aurora F1 series. In 1979 he should have moved to F1 with Ensign, but was refused a 'superlicence' (shame!). He eventually got his chance here at Zolder when Ensign were waiting for Jan Lammers to be released by ATS. He just scraped onto the grid (last but one qualifier), but the engine let go after 12 laps. He failed to qualify at Monaco and that was that (as far as GP racing went). There was interest shown for 1981, but no GP seats were available so Tiff turned his hand to sports cars, starting off with odd-balls like the Ibec, Nimrod, Dome and Spice before driving for Toyota in 1987, then progressing to a Porsche 962 from 1989 to 1992. His best result in sports cars was 3rd at Le Mans in 1990 with Derek Bell. He then had a couple of years in the British Touring Car Championship with Nissan, before returning to sports cars in 1995, driving a Porsche at Daytona and a Jaguar XJ220 at Le Mans. He then drove the Lister Storm for 3 years, reaching 3rd overall at Daytona in 1997 before gearbox problems dropped them to 19th. In 1998 he finished 2nd in the GT1 championship and won the Silverstone Golden Jubilee Trophy race. In the meantime, Tiff had developed his media career, starting with track tests and feature stories in the early 1980s, doing some commentary with Murray Walker and joining 'Top Gear' in 1987. He also presented NASCAR and Indycars on Sky Sports in 1992.